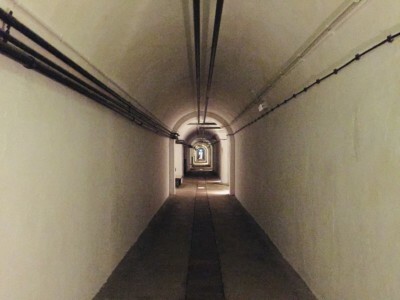 When I wrote my previous post on my one-night in Jersey, I said I would write another about my trip to the Jersey War Tunnels Museum. I wanted to do this because it’s one of the best museums I’ve visited in a long while (that and Chicago’s Museum of Science of Industry that I posted about last year). The museum is just a few miles outside of the capital, St. Helier, but it’s easy to get there. You can catch organised trips that drop you off, or take the vintage Jersey War Tunnel shuttle bus. Alternatively, you can catch the local bus, which for around £2 will take you all the way in 15-20 minutes. 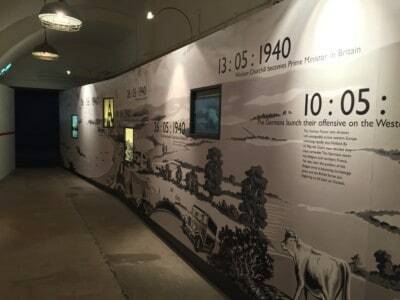 The museum is housed in the German Ho8 (Hohlgangsanlage 8) tunnel system that became an underground hospital in the early 1940s and explores the German occupation of the island between 1940 and 1945. 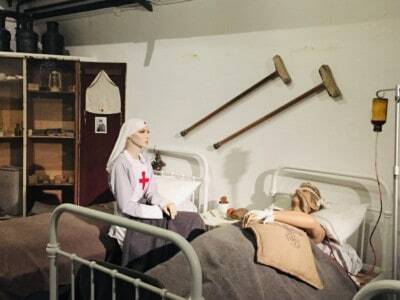 Although the digging of the tunnels was never completed, the 1km that was finished was large enough to house a hospital (big enough for 500 casualties), a boiler room, and offices, some of which are recreated in the museum. The level of detail found in the museum is impressive and the exhibits are fascinating: from the creation of the tunnels (which were dug using forced labour, with over 5,000 men from across Europe and North Africa being brought in to undertake the backbreaking work), to the first influx of the Germans onto the island in July 1940, and the new rules and regulations they brought in (including putting the clocks forward an hour to synchronise with central European time, banning all radios and creating a register of Jews). You discover how much the islanders suffered, even with the absence of direct fighting. From practical issues like basic supplies, food and fuel, becoming extremely scarce to the wider repercussions over its strategic importance: how over time Hitler moved to make Jersey into an “impregnable fortress”, bringing in more workers to dig bunkers and trenches and to build the Atlantic Wall defences that you can see when you drive around the coastline. Towards the end of the war, the islanders’ situation became even more dire, with Winston Churchill refusing to send supplies. Whilst this prevented them falling into the Germans’ hands, it also meant that there was nothing for the locals (eventually food was distributed by the Red Cross on the strict proviso that none of it was given to the German occupiers). Some of this wasn’t entirely new to me. 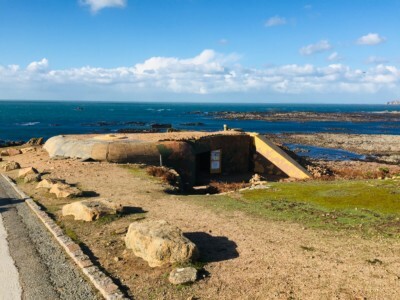 Although this was my first visit to Jersey and I was learning a lot about life under the German occupation, I’ve visited a few World War 2 museums in the past, so some of the information about how the Nazi regime treated its occupied territory was familiar. But the museum does more than just present historical facts. For me, what was most memorable was the way it gets you to think about life as an islander under an occupying power. The exhibits really challenge you to step into the shoes of the Jersey residents and think about how you would act if you were in their situation. 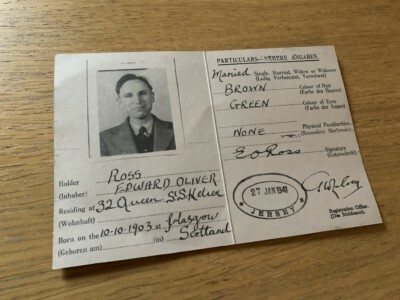 An example is where you learn about the resentment that some of the island’s residents had when they discovered other islanders were breaking the rules set down by the Germans – such as keeping a banned radio or hiding weapons. Some would gladly inform on their fellow islanders, resulting in generous rewards for them, but severe punishment for the transgressor. You can look through some of the rule books and ledgers that people had to adhere to, as well as letters sent to the Germans informing on their compatriots. One fascinating exhibit sets out six situations (e.g. you discover your neighbour has done X, Y or Z), and asks what you would do in that situation. It really gets you to think about life under a dictatorship. Would you be prepared to provide information to the enemy in return for a reward or a job for a family member and other privileges? And so, on face value, whilst I could never seriously believe that I would become an informant, the “what would you do” proposal forces you to think about how you would act when faced with the possibility of being able to feed your family for the next few weeks in exchange for a snippet of information. You also find out about life in the early days of the occupation and it seemed that at this time, it was not especially unpleasant – the lack of fighting on the island meant that the German soldiers initially treated their time there as a bit of a holiday, walking along the beaches and strolling in the sunshine. Stories and photos depict German soldiers in friendly conversation with the locals, buying ice creams for babies and helping residents. Some people viewed this with suspicion, whilst others saw the soldiers for what they were – young men who were carrying out orders and were far away from home and families. Again, you’re challenged over what you would do – accept the generosity of another human being or reject it because they are the enemy? Another interesting dilemma is whether you would stay where you were born and bred, even in the face of imminent invasion, or whether you would pack what belongings you could carry and leave for the UK mainland. 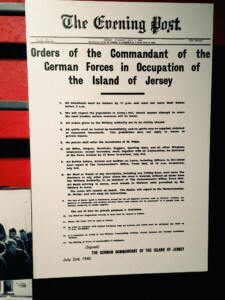 Back in the summer of 1940, the residents of the island were given 24 hours to decide, having learnt that the British Government had decided that Jersey would not be defended. Nearly 23,000 people registered but in the end only 6,600 left. It made me think – what would I do? And finally, there’s also a really effective demonstration of the conditions that forced labourers worked in, in “the unfinished” tunnel. Holograms of workers – complete with audio effects – are shown toiling in dark and dangerous conditions with rocks falling all around them. If, like me, you come across this section without knowing of its existence, it’s a bit of a shock – suddenly walking into a loud, (too loud), dark room where your eyes need to adjust very quickly to make out the dimly lit figures digging in a tunnel in the distance. But this makes it all the more effective as you get a small insight into how awful it must have been to be trapped in these conditions for 12 hour shifts with no escape. And then finally as you leave, you can stop off in the gift shop opposite and reflect on the museum exhibits in the upstairs café. When you first enter the museum, you are handed an identity book for one of the islanders, issued by the Germans. In the café, you can find out what happened to that individual. So, to say this museum gave me a lot of food for thought is a bit of an understatement. This really is one of the best museums I have visited for a long time and left a lasting impression on me. An adult ticket for the museum is £13 (senior citizens £12, students £11.00 and children £8.00). Between 1st March and 31st October it is opened daily between 10am and 6pm. For the first 3 weeks of November, there are reduced opening hours of 9am to 2.30pm. Brilliant post, you make me want to visit as always! Thanks Karen – you should put it on your list! 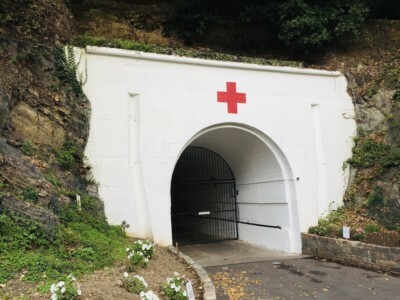 Wow a hospital inside a tunnel.. what a fascinating piece of history! It’s such a fascinating place. Thanks for reading!